At some point, as you are wandering the irradiated wasteland of Sheltered, you will come across a mysterious sealed hatch. After hundreds of visits to torn down churches, ransacked stores, and deserted police stations differentiated mainly by the type of loot they offer, the sheer uniqueness of the situation comes as something of a shock. There is no loot, no wandering parties interested in exchanging either goods or blows. Just this wholly unfamiliar structure made impregnable by a four-digit electronic combination lock – a level of security suggesting a rather monumental discovery. It is a watershed moment for one’s appreciation of the game, both in a positive and a negative sense. On the one hand, it is a genuinely exhilarating moment to find something so unprecedented after several hours of gameplay and the creeping assumption that you’ve already seen all the game has to offer. 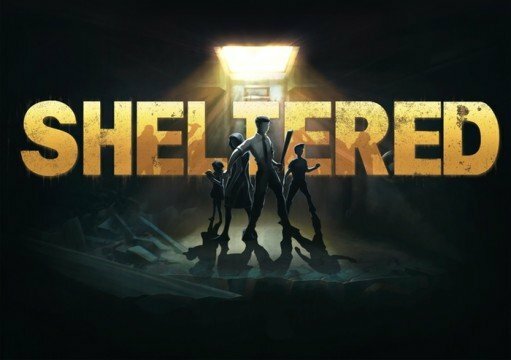 On the other, it serves to foreground the monotony of Sheltered‘s limited, though undeniably addictive, range of interactions, by suggesting how much richer the experience could have been had it been peppered with more such extraordinary events. 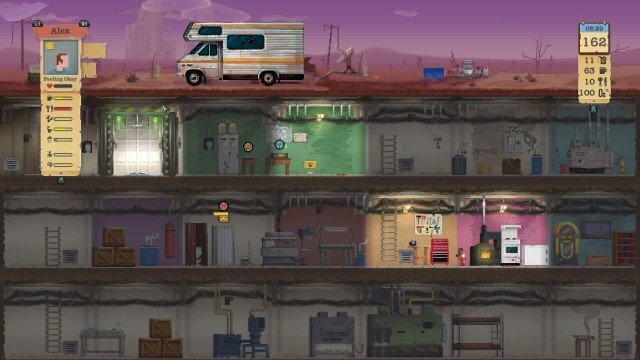 Unicube’s post-apocalyptic survival game has obvious similarities to both Fallout Shelter and This War of Mine, not least in the way our refuge is presented as a (rather ugly-looking) vertical slice inside which we control our wards’ actions with the aim to make their difficult lives bearable. 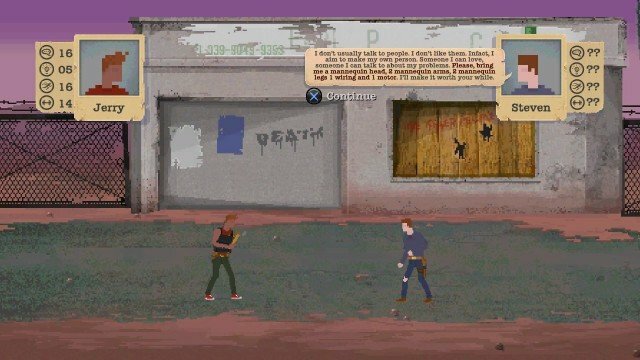 Most of Sheltered‘s real-time action takes place in that gloomy vault and most of our characters’ early efforts are directed toward restoring their new home to make it habitable while tending to their basic needs such as eating, sleeping, and taking a shower whenever a storm has filled the reservoir with polluted rainwater and there’s no pressing need to conserve. It’s a depressingly empty home at first, but given time and resources, it can become a welcoming one. Basic infrastructure such as air and water filtration can be upgraded to make life easier, new systems, like plant growing stations and ammunition presses, can be installed, and decaying, graffiti-covered walls can be repainted to make the place more presentable. The game’s central loops revolve around acquiring the materials for crafting these improvements while making sure that both the shelter and the people inhabiting it stay in good shape. There are two ways of obtaining crafting materials, which can be anything from wooden planks to circuit boards. You may roam about looking for abandoned buildings to pillage, or you can trade for them with other survivors. The first option is the most profitable, but also the riskiest one – the wasteland is a dangerous place, home to ferocious animals and vicious gangs. Unlike This War of Mine, there is no real-time action in those trips. Exploring an empty building presents you with a list of available loot and, whenever encounters turn nasty, combat is resolved through basic turn-based mechanics. This lack of hands-on engagement and the bare utilitarianism with which each of these excursions is ultimately resolved brings Sheltered closer to the hypnotic motifs of The Oregon Trail (or, indeed, its apocalyptic offshoot The Organ Trail) than to the more polished effort of 11 bit studios. Sheltered‘s logistical-mindedness is its greatest appeal as well as its most serious flaw. The first few weeks of life inside the vault are as exciting and addictive as any game in recent memory, and I went through my first six-hour session of the game without even noticing it. As you are learning the unwritten rules of life after nuclear Armageddon, scrounging up resources in order to build that vital improvement, and taking on new recruits, every single one of your near-identical excursions is loaded with meaning: this one because you need to replenish your ammo cache, that one because you need a motor for a proper stove. Progress enough, however, and the joy is gone, replaced by the tedium of semi-automated, blandly convenient life in a fully upgraded and equipped subterranean home that lacks for nothing – in a sense, as accurate a simulation of life in a post-apocalyptic environment as any I’ve played. There is not much to do in Sheltered other than seeking out crafting materials and, once you have no further need of them, having already built whatever was available, that’s when the realization strikes of how much the game needed more things like that singular sealed hatch, more mysteries and secrets and yet-to-be-explored corners in its world for the player to look forward to. Unicube has attempted to insert a few diversions to spice things up in the late game. There’s a camper van whose necessary parts are rather hard to scavenge; there are schematics to gather which allow you to construct special pieces of equipment and structures; and there is always the threat of invasion, though I wouldn’t know it if not for the corresponding achievement – in 160 days of survival I’ve yet to fall victim to an invasion attempt. These are all useful additions but they are simply not enough to keep you going with the same enthusiasm. It’s possible, however, that the more obsessive-compulsive players will persist, finding joy in basic resource management and tending to their characters’ daily needs. I know I did, as I kept playing several hours after I had already not just covered the essentials, but fully upgraded my home with every available improvement. Yet an addictive game is not necessarily the same as a great one, and Sheltered, for all of its early excitement, eventually degenerates into a series of repetitive chores. I was hooked for a while, even after days started blending into each other and there was nothing new to look forward to. But, when I finally turned it off it almost felt like leaving a dank basement behind and stepping into the light again. This review is based on the PS4 version of the game, which we were provided with.